Last September, a massive new region of magnetic field erupted on the Sun’s surface next to an existing sunspot. The powerful collision of magnetic fields produced a series of potent solar flares, causing turbulent space weather conditions at Earth. These were the first flares to be captured, in their moment-by-moment progression, by NJIT’s recently expanded Owens Valley Solar Array (EOVSA). With 13 antennas now working together, EOVSA was able to make images of the flare in multiple radio frequencies simultaneously for the first time. This enhanced ability to peer into the mechanics of flares offers scientists new pathways to investigate the most powerful eruptions in our solar system. “These September flares included two of the strongest of the current 11-year solar activity cycle, hurling radiation and charged particles toward Earth that disrupted radio communications,” said Dale Gary, distinguished professor of physics at NJIT’s Center for Solar-Terrestrial Research (CSTR) and EOVSA’s director. The last flare of the period, on September 10, was “the most exciting,” he added. Radio emissions are generated by energetic electrons accelerated in the corona, the Sun’s hot upper atmosphere. Modern solar physics relies on observations at many wavelengths; radio imaging complements these by directly observing the particle acceleration that drives the whole process. By measuring the radio spectrum at different places in the solar atmosphere, especially when it is able to do so fast enough to follow changes during solar flares, it becomes a powerful diagnostic of the fast-changing solar environment during these eruptions. EOVSA, which is funded by the National Science Foundation, is the first radio imaging instrument that can make spectral images fast enough – in one second – to follow the rapid changes that occur in solar flares. This capability allows the radio spectrum to be measured dynamically throughout the flaring region, to pinpoint the location of particle acceleration and map where those particles travel. Images of solar flares at most other wavelengths show only the consequences of heating by the accelerated particles, whereas radio emission can directly show the particles themselves. Gary presented EOVSA’s new findings this week at the Triennial Earth-Sun Summit (TESS) meeting, which brings together the solar physics division of the American Astronomical Society (AAS) and the solar physics and aeronomy section of the American Geophysical Union (AGU). Among other discoveries, scientists at EOVSA have learned that radio emissions in a flare are spread over a much larger region than previously known, indicating that high-energy particles are promptly transported in large numbers throughout the explosive magnetic field "bubble" called a coronal mass ejection (CME). Sunspots are the primary generator of solar flares, the sudden, powerful blasts of electromagnetic radiation and charged particles that burst into space during explosions on the Sun’s surface. Their turning motion causes energy to build up that is released in the form of flares. EOVSA was designed to make high-resolution radio images of flares (1-second cadence), sunspot regions (20-minute cadence), the full Sun (a few per day) and hundreds of frequencies over a broad frequency band, making it the first solar instrument able to measure the radio spectrum from point-to-point in the flaring region. “We are working towards a calibration and imaging pipeline to automatically generate microwave images observed by EOVSA, and make them available to the community on a day-to-day basis,” added Chen, who is leading the EOVSA pipeline effort. Initially, he and his colleagues were unable to tap into these new regions, however. 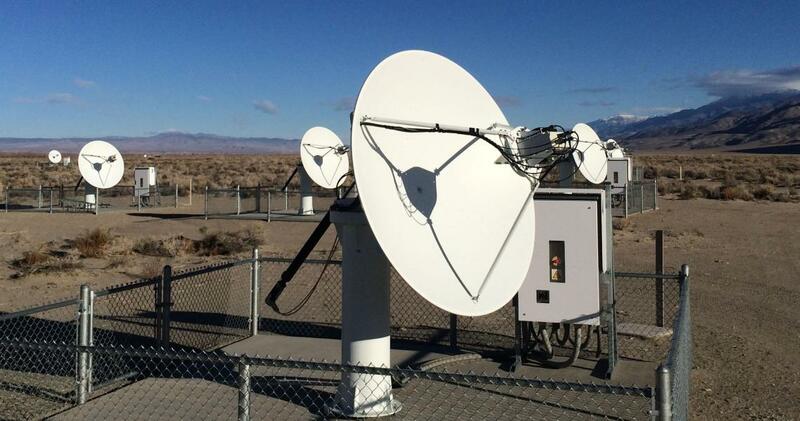 After the array was completed, they realized that cell phone towers in the Owens Valley were causing much higher levels of radio frequency interference than expected. As a result, they designed "notch" filters that were able to cut out the frequencies most affected by cell towers. With new funding from NASA, Gary and colleagues will measure the spatially-resolved radio spectrum of solar flares, determine the particle and plasma parameters as a function of position and time, and then use 3-dimensional modeling, which his group has developed, to fully understand the initial acceleration and subsequent transport of high-energy particles.